High performance Aluminum Oxide cuts fast, lasts a long time, resists loading and leaves a consistent finish. Use these products with a soft interface pad to scuff sand before painting. Use them to remove runs, dust nibs and excess orange peel from topcoat finishes before repainting or buffing. Discs are easy to remove from backup pads. They are faster and easier to use than scuffing pads, and there's none of the dry time you get with wet sanding. 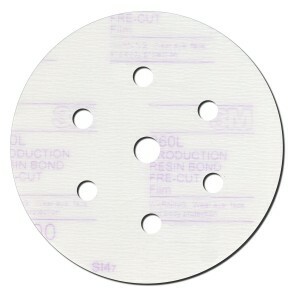 3M™ 1500-grade Hookit™ Finishing Film discs feature a dust-free design that speeds work. The 6 inch discs are used to level minor dust nibs and for light sanding of mismatched orange peel for all types of automotive paint. Recomended disc pad 05865 with soft interface pad 05777.